See the startling scenery of Chile’s Lake District from different perspectives on this 4-hour small-group tour from Puerto Varas. First, look out over the postcard-worthy landscape of Llanquihue Lake, framed by the volcanic peaks of Osorno and Calbuco. 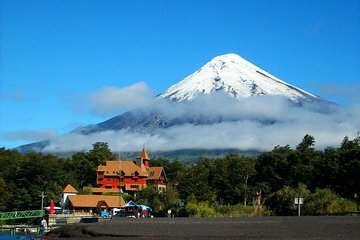 Next, climb to a height of 3937 feet (1,240 meters) and enjoy glorious aerial views from the Osorno Ski Center. If that’s not high enough, you can also opt to ride the chairlift (extra cost) to the lookout points at Station Primavera or Station Glaciar.